Have you ever wanted to see the roads through the eyes of a taxi driver? 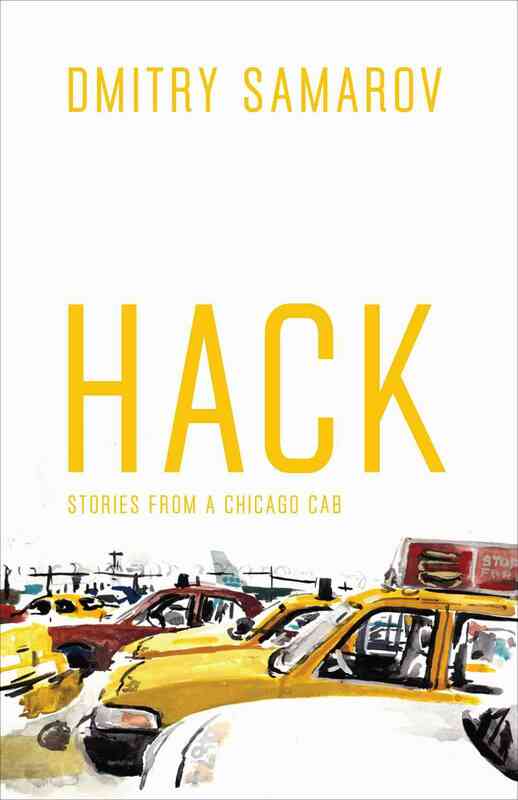 Take on the life of a cab driver through Hack, a blog turned illustrated memoir, by former Chicago cab driver Dmitry Samarov. Samarov began driving a cab in 1993 to support himself as an artist and utilized his creative abilities to produce amazing blog entries, memoirs and pieces of artwork. His stories and paintings bring you into the daily life of a cab driver, through the rush hour nightmares, rowdy passengers and long waits with fellow drivers. Hack as well as Samarov’s paintings provide a memorable and moving view of the taxi industry, certainly a misunderstood profession. So you write “Hack,” a very popular blog based on your experiences as a Chicago taxi driver. What is the blog about? What prompted you to start this blog? The blog started in 2006 as a way for me to write about my experiences behind the wheel of a cab in Chicago. I’d first used the name “Hack” (short for hackney carriage, which is what taxis used to be called) for a zine I made in 2000-01 about my time driving in Boston from 1993 to 1997. We would love to find out more about you. What initially led to you the decision to give driving a cab a try? In 1993 I graduated from the School of the Art Institute of Chicago with a BFA in painting and printmaking. I moved back to the Boston area to be near my family and needed a job. Scanning the paper one day I came across a DRIVERS WANTED ad and followed it to the Checker Taxi Company of Boston on Saint Botolph Street. I’d end up driving a cab twelve of the next twenty years. We hear once you start, it’s hard to stop! You say you feel at home in Chicago; what makes this city special to you and why did you choose to drive a cab there? I went to school here and after going back to Boston for a few years (and being reminded of all I hated about that city) I was thinking of where I could move to. An old art school friend needed a roommate at his new place in Wicker Park and that seemed like a good excuse as any to move back. 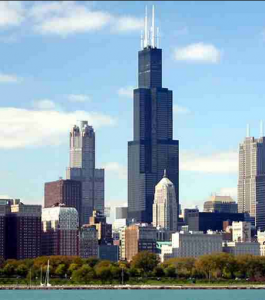 I can’t really say why Chicago is the place for me other than to say that I’ve been here over twenty years now and still feel like there’s more to see and know. I started driving a cab here in 2003 because I got sick of bosses, co-workers, bars, restaurants, and stores I’d been working at. One of the perks of the job is that you work for yourself. Yes, working for yourself has great benefits and also a great satisfaction. You told us you are no longer driving a cab, but I am sure you have a lot of stories from your experiences. Can you share your most bizarre encounters with passengers while driving a taxi? Anything and everything you could think of was done in my cab at one time or another during my twelve years on the job. Check out my book to read all my stories. “Challenged accepted,” huh? Hahaha. OK, a serious question: If you were the “taxi king of Chicago,” what would be the one thing you would change about the taxi industry and its job expectations? I would raise the fare rates so that drivers could earn a living without having to put in 80 hours a week. Most people have no idea what lengths drivers have to go to to just scrape by. Not only were you a taxi driver, you are also a popular painter. 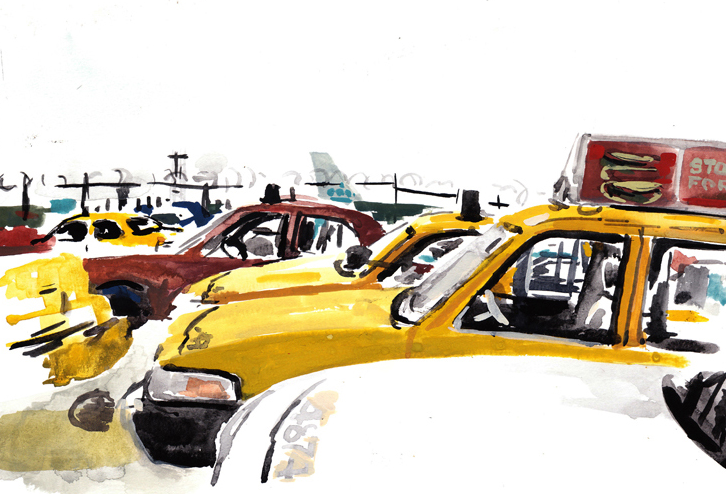 We love your paintings of taxis and taxi scenery. 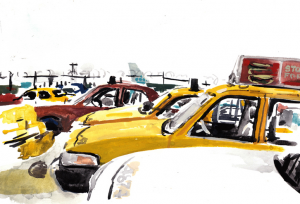 How did your experiences as a cab driver influence your paintings? Did you draw inspiration from your co-workers, passengers and surroundings alike? Spending sixty to eighty hours a week anywhere can’t help but make an impact on your artwork. I did many paintings sitting in the cab at the airport or just on some corner in the city, looking out the window. I also did a lot of illustrations of my passengers and things that happened while driving to help tell my stories. You say you decided to take your blog down; why? Will we be seeing some of your great stories in upcoming projects? I felt that the stories had been up for anyone to read for free online for long enough. Also, since publishing my first book in 2011, I’d thought of the blog as a sort of first-draft for a more finished project. I have a second book of cab stories that will probably come out in 2014. Lastly, what you are currently working on and what we should expect next? As always, I continue to focus on my artwork first and foremost. I update my website fairly frequently but you can also follow me on Twitter or Tumblr. Then there’s that second cab book, which should have a publisher pretty soon. I’ve also been working with filmmaker John McNaughton on a TV show adaptation of Hack which will see the light of day whenever the mysterious forces in Hollywood decide to give it the green light. I’ve recorded a spoken-word CD with improvised music. The pieces were culled from cab stories as well as other newer material having to do with my immigration experiences. Lastly, I’ve started another project called Art in its Own Terms. I keep busy! We would like to thank Dmitry again for his willingness answer our interview questions; your time and effort are greatly appreciated! Find out more information about Dmitry Samarov on his website: http://www.dmitrysamarov.com/.